The I-195 Redevelopment District Commission has approved the design plan for a mixed-use development that will occupy a one-third acre parcel in the Fox Point neighborhood. The project, pursued by Royal Oaks Realty LLC, will occupy Parcel 8 in the former I-195 lands. 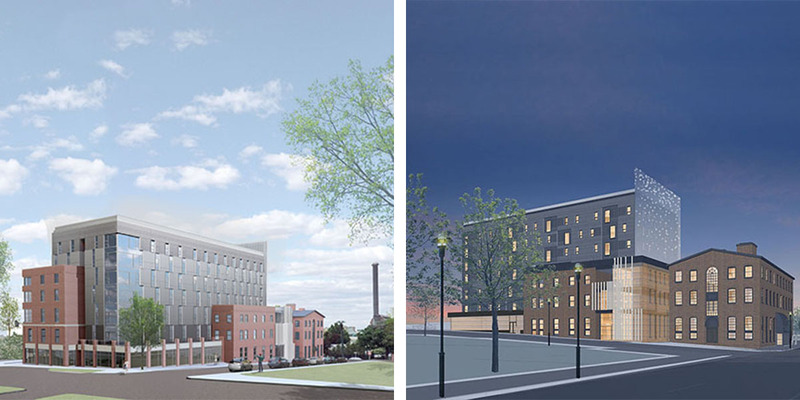 The development will include the renovation of a historic building, part of the former Fuller Iron Works, as well as new construction of a seven-story building that will include apartments, office space and retail space. The I-195 Redevelopment District Commission moved closer Monday to securing the sale of five acres of land for a biological sciences and mixed-use development. In a vote taken in executive session, the commission agreed to authorize its executive director and chairman to execute a purchase and sale agreement for parcels 22 and 25, according to chairman Joseph F. Azrack. I think that light display will look pretty cool coming into Providence on 195. Seeing that in the foreground while crossing the bridge and the skyline in the background will probably look pretty neat. Taste is subjective: I like it myself. Kite does great work. I’m really excited to see the Parcel 8 building go up. I’m honestly surprised to hear that people like this design. The metal cladding and random window placement just don’t do it for me, especially where it’s going to be built. It just seems boring and uninspired. It’s a wasted opportunity for something truly beautiful in a high visibility location. The biggest crime here is the lost opportunity to create an appealing connection from the Wickenden neighborhood to the waterfront entertainment cluster via Pike Street. Between the 2 areas of classic streetscape there will always be a long dull stretch of highway-like streets and garages. Yes, that’s also true. I could tolerate a design I don’t personally care for if it at least interacted at the street level. Right, Eric. Why don’t they get that? In renderings, these buildings gleam ludicrously amidst green fields and people appraise their beauty or lack of it from the perspective that will matter least once the thing occupies space in the actual city. Take the mall downtown. One cheer for it not being a giant featureless box like you see in the burbs. I guess they tried. From blocks away, it is not at all bad looking, kinda traditional. But walking alongside it makes you feel like you are six inches tall. Interesting features are few and far between. Nowadays buildings are designed with only one thing in mind: How they will look through a moving windshield.